Rocking a pair of pricey earbuds? Well, there’s no shame in being excited, but don’t celebrate by cranking that sound up. You could bust the delicate circuitry in that noggin of yours. Studies show that young people ages 11 to 19 are increasingly experiencing some sort of hearing impediment. According to the Third National Health and Nutrition Examination Survey, published in The Journal of the American Medical Association (JAMA), as many as one in five teens are afflicted. And that’s not all. The scientists, who have been tracking adolescent hearing since 1988, have noticed a whopping 31 percent rise in hearing loss. If this goes unchecked, we’re looking at some pretty severe consequences. One look at the Baby Boomer generation is all it takes to see that. Affliction rates in boomers are fast approaching the half-way mark, with roughly 44 percent showing signs of significant hearing loss by age 69. That’s nearly one out of every two people requiring a Miracle Ear or some other hearing aid. According to Randy Judson, AuD, clinical director of audiology services at the New York Ear and Eye Infirmary, hearing loss falls into three categories: The first is conductive (CHL), which is usually due to issues in the middle ear, like a ruptured eardrum, water, ear infection or abnormal hearing bones. Then there’s sensorinueral, or noise-induced hearing loss (NIHL). This comes from nerve problems which can stem from exposure to loud noises, certain medications, genetics and aging. The third type is a combination of the first two. Problems can come from an extremely loud burst of sound, or lengthy exposure to anything above 85 decibels. To get a sense of how loud that is, V-Moda created this sound chart. Back when V-Moda CEO Val Kolton used to DJ, he wore earplugs under his headphones. Now his company produces a $20 set of earplugs designed to preserve clarity while lowering the decibel level. He says the company offers the V-Moda Faders at a loss to help build awareness of hearing loss issues, part of which may be attributed to the lack of standards for hi-def headphones. Although he wouldn’t call out any particular brands, suffice it to say that consumers shouldn’t necessarily trust the labeling that’s on the box. Some products can have as much as a 10-decibel margin of variation. Hearing loss is a real and growing problem. In New York City, Mayor Bloomberg is ear-marking $250,000 for his Hearing Loss Prevention Media Campaign, to dissuade teens from blasting their music using social media and other methods. Specifically, he’s targeting young tech users and their earbud usage. And Regal Cinemas just stepped up its deployment of Sony Entertainment’s Access System, to support the moviegoing experience for deaf or blind patrons. By the end of May, 6,000 Regal theaters will offer specially designed glasses that can not only explain the action on the screen for visually impaired customers, but also display personal closed captioning for hearing-impaired viewers. So what can you do to prevent problems if your hearing is still healthy? In general, over-the-ear headphones are preferable to in-ear buds that pipe sound directly into the ear canal. But if you’re a fan of the latter type (like I am), then consider springing for a set that seals well enough to block outside sound. This way, you don’t have to dial up the volume, just to overcome ambient noise. Sound-canceling over-the-ear headphones are also great for the same reason. The idea is to go for clarity over volume. Whichever personal audio gear you choose, please don’t walk around on the streets with both ears compromised. These types of accessories are designed to block outside noise — which means you can’t hear if someone’s yelling to warn you about an oncoming car. If you’re concerned about hearing loss you may have already suffered, you can start off by doing a self-check with one of the numerous apps in Google Play or the App Store. This can’t replace an actual test from a professional hearing clinic or a doctor’s examination, but it does offer a starting point. 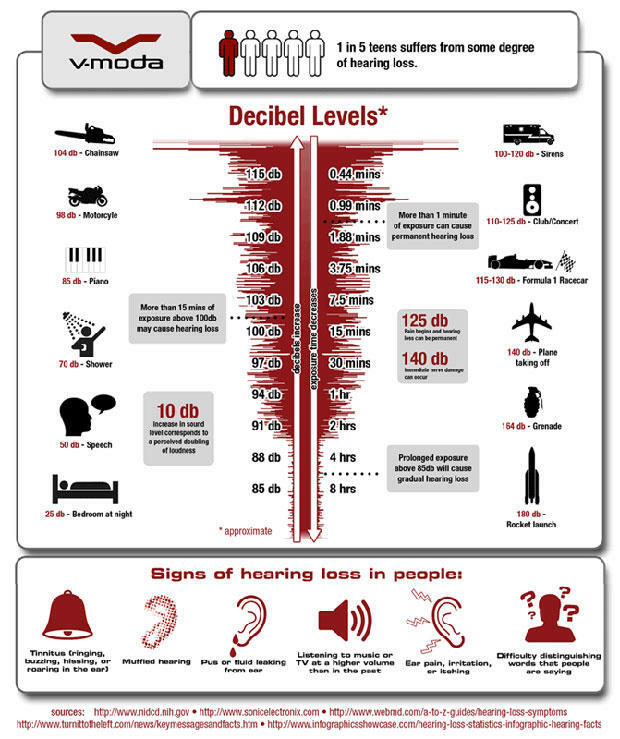 If you have noticeable hearing loss, however, don’t delay in seeing a professional immediately. You’ll want to nip the problem — and the behavior that might be causing it — in the bud, if you can.